Submissions to the Docket are now made directly by the respective offices and departments as seen in the Categories list on the right side of the page. If you need a Docket account for your department, or if you have any problems or questions, please send a request to law.web@nyu.edu. NEW: If adding a post to the “Deadlines” category, use date field picker below the editor to indicate the date of your deadline. Your post will be displayed with the date prefixed in front of the post title. You don’t need to include the date in your title. Only deadlines occurring in the next 30 days will be included in the email. Add only internal NYU Law deadlines. 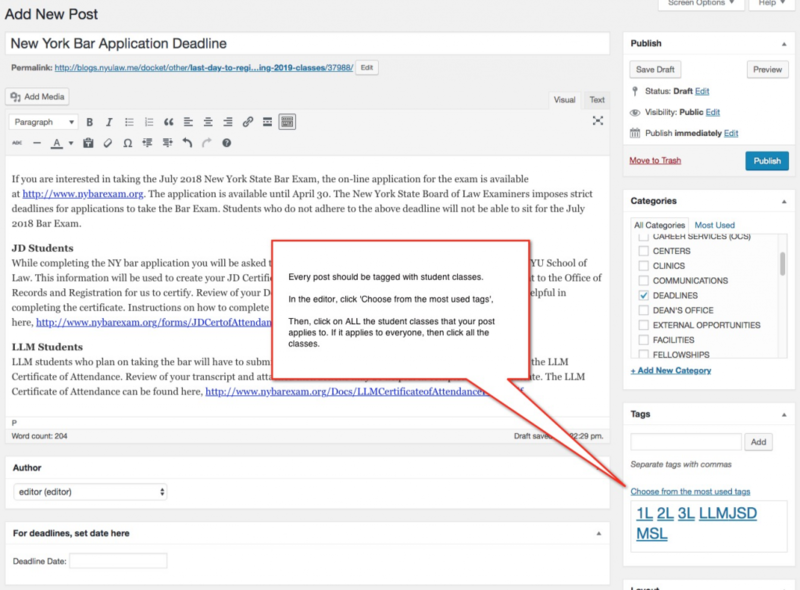 Use the “External Opportunities” category for non-NYU Law deadlines. 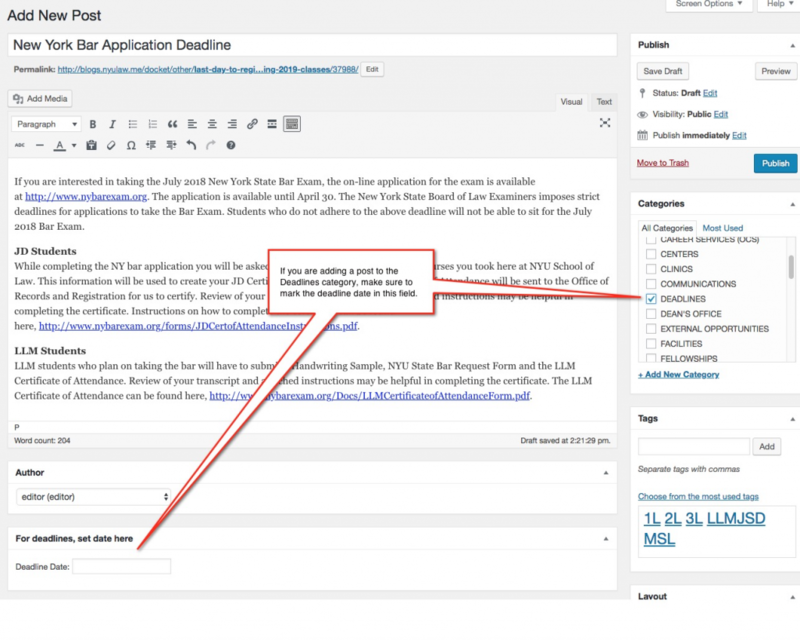 Do not use this category for grouped deadlines; each post should be a unique deadline. To see this in action, see the first example illustration below. Please choose ONE category in which to display your post. If you aren’t sure what category to pick, use the “Other” category. Your post will be included in the “Announcements” category in the Docket email. Please DO NOT post to the “Career Services” or “PILC” categories without first getting approval from those departments. Please use your department category for announcements relating to students’ NYU Law experience. Announcements relating to things outside of the NYU Law experience should be added to the “External Opportunities” category. We’ve changed the audience selections to be Tags instead of Categories. Please select the specific class or classes that your post applies to. Select every class if your post applies to everyone. To see this in action, see the example illustration below. Reposting is OK in moderation. Please don’t repeat your announcement more than is absolutely necessary. Consider changing the title in subsequent posts to bring more attention to it. Please do not create duplicate posts of the same content. If you need to re-run your announcement for a second week, edit the original listing and modify the publication date to be included in the next week’s issue. The Docket email includes any post dated between 12:01 a.m. of the previous Monday through 12:00 a.m. Sunday night. Please Use Title Case for Your Title (capitalize all words except for the, for, to, of, etc., unless it is the first word of the title). Make sure your title clearly and succinctly describes your post (not too short; not too long). AUAIYT: Avoid using acronyms in your titles. Some students may not be familiar with them. Do not USE ALL CAPS FOR YOUR TITLE. It’s a bit like SHOUTING!